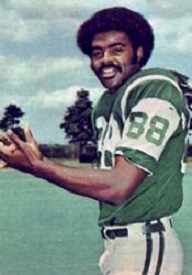 Caster was chosen by the Jets in the second round of the 1970 NFL draft in the hope that he would bolster an aging corps of wide receivers. He caught 19 passes for 393 yards (20.7 avg.) and three touchdowns as a rookie and followed up with 26 receptions for 454 yards (17.5 avg.) and six TDs in ’71. While he had problems with inconsistency, Caster was shifted to tight end where it was hoped that his size and speed would be of benefit. Jets went 7-7 to finish second in the AFC East while leading the NFL in passing yards (2777) and placing second in total yards (4787) and scoring (367 points). Caster followed up his breakout season with 35 catches for 593 yards (16.9 avg.) and four touchdowns in 1973, continuing to display great ability but having problems with consistency as well. He had two Pro Bowl seasons in 1974 and ’75, leading all NFL tight ends in the second year with a career-high 47 catches, for 820 yards (17.4 avg.) and four TDs. Caster’s performance dropped off in 1976 and he was shifted back to wide receiver in an injury-plagued ’77 season. He was traded to the Houston Oilers in 1978 and mostly backed up as a wide receiver and tight end over three years, catching a high of 27 passes for 341 yards in 1980. Following an abortive stint with New Orleans in ’81 Caster was picked up by the Washington Redskins, where he finished his career in 1982. Overall he caught 322 passes for 5515 yards (17.1 avg.) and 45 touchdowns, with 245 of those receptions for 4434 yards (18.1 avg.) and 36 TDs coming with the Jets. Caster was a first-team All-AFC selection once, received second-team honors after two other seasons, and was named to three Pro Bowls.